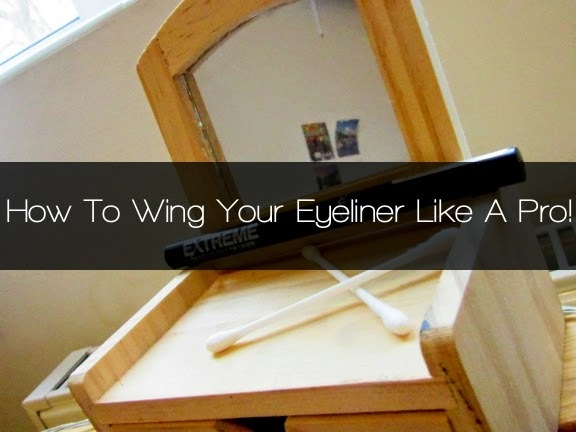 How To Wing Your Eyeliner Like A Pro! Since kohl eyeliner always manages to work its way down my face by the end of the day, liquid eyeliner is a bit of a godsend for me. I'm particularly fond of the felt tip liquid eyeliners which I find much easier to apply, and I'm currently using Collection's Extreme 24 Hour Felt Tip Liner (as mentioned in my 14 Favourites of 2014). I know a lot of people who struggle to apply liquid or felt tip liner, but I use a real fuss-free way to apply it, wings and all. So today I'm going to share with you how I apply my felt tip liner really easily and super-fast. I'll even time it. Just for you. STEP 1. On a day-to-day basis when I go to work, I tend to just wear felt tip liner, mascara and a teeny bit of eyeshadow on my eyes. This is the look I'll be showing you today. I start off by applying my base makeup and do my eyes last of all (in the pictures here I actually have no base makeup on at all because they were taken on a lazy Sunday afternoon). STEP 2. I apply my felt tip liner in the rough shape I want it. There is no need for accuracy quite yet! It doesn't matter if it's too thick or the wing is too long at this point. Just make sure you apply as close to the lash line as you can so there are no gaps. As you can see, my application is incredibly wonky and I'd get some seriously strange looks if I went out like this. STEP 3. Here's the clever part. Wet the end of a cotton bud and carefully trace it along the wonky eyeliner. This is a lot easier than achieving a straight line from your first application of the liner and creates a beautiful smooth edge. You can use the cotton bud to fix the length and thickness of the wing of the eyeliner if you're not happy with this too. You don't even need to use an eye makeup remover on the cotton bud, just water will do at this stage as it shouldn't have dried thoroughly yet. As you can see, the wing on my eyeliner isn't that long as this is just a typical look I'd wear to work. If I was going on a night out I tend to go for a more winged look, and this can easily be achieved by using this method of winging and cotton bud-correcting as you go. STEP 4. Stand back and admire your gorgeous eyes. If you've accidentally taken off too much, it's much easier to just top up the liner now. I finished off this look using mascara (Bourjois Volume 1 Seconde) and a tiny bit of highlighting eyeshadow in the inner corners of my eyelid (third shadow in on the top row of the MUA Undress Me Too palette). And that's it! If you want to apply more eyeshadow, the liner may go slightly grey but this can be easily rectified with another quick sweep to accentuate the liner underneath. I hope this helps, and please let me know if you have any other tips! And for those of you who are wondering, I timed it and I created this eyeliner look in 2 minutes and 19 seconds. Perfect for those days when that extra five minutes in bed is really needed! And thanks for the follows, I'll be sure to have a look at yours! I needed this post haha, im the worst with eyeliner! Great tips. I think winged eye liner may be up there with one of the hardest things we women ever have to do so any help is greatly appreciated.